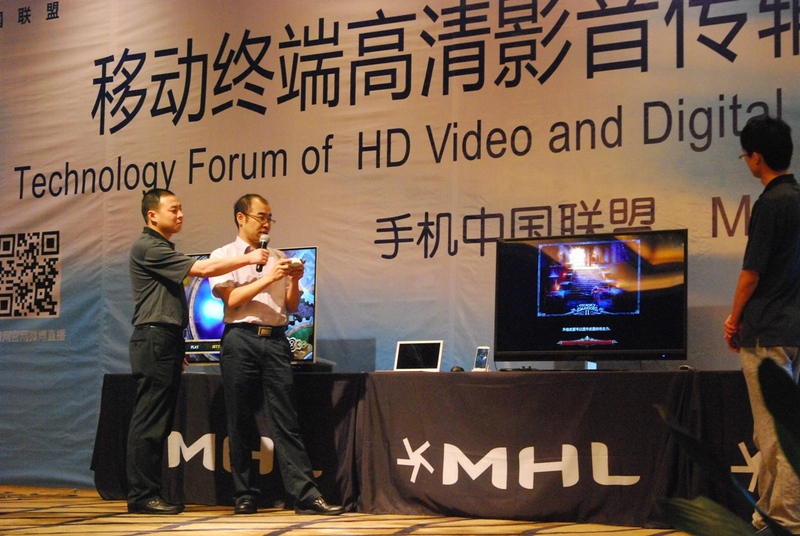 SUNNYVALE, Calif., — Oct. 29, 2013 — MHL, LLC today announced that it recently co-hosted the “Technology Forum on HD Video and Digital Audio Interfaces for Mobile Devices” with the Mobile China Alliance (MCA), an association representing leading companies in China’s mobile industry. As the leading HD mobile-to-display connectivity standard, MHL technology is poised to enable consumers in China, a region that represents the world’s largest smartphone market, with simple “plug and play” solutions to transform a smartphone into a gaming console, a fully functional portable office, an automotive infotainment or home theater system. “In China, the market for mobile gaming has doubled from 2012 to 2013. The MHL Consortium and China Mobile agree that mobile is the future of entertainment centers, and connecting mobile devices to a television or monitor enables a variety of multi-screen applications,” said Zhijun Zhao, Dept. of Operations Support Director for China Mobile Game Service Center. In a recent press release, market research firm IDC shared its forecasts on the China smartphone market. IDC forecasts that China’s smartphone shipments will reach 360 million in 2013 and expects China’s smartphone shipments to potentially exceed 450 million in 2014. With its “plug and play” features, MHL has been adopted in the automotive sector, allowing consumers to connect MHL-enabled smartphones to the in-vehicle infotainment system where the mobile phone apps can be accessed through the touch screen while simultaneously charging the mobile device. MHL can also be used in the rear seat monitor so that passengers can enjoy portable entertainment at any time. According to Dr. Judy Chen, both applications provide seamless transmission of content from the mobile phone to the vehicle’s display. MHL, LLC recently released the MHL 3.0 specification, which addresses the latest consumer requirements for connecting a mobile device to displays, while simultaneously charging the device. With double the bandwidth compared to the previous specification, MHL 3.0 delivers 4K (Ultra HD) resolution and a wider color gamut to create a more brilliant visual experience. By using a bi-directional channel that is significantly faster than MHL 2, the new specification enables concurrent 4K video and high-speed peripheral support of mass storage and input devices such as a touch screen, keyboard and mouse. Today, there is an installed base of more than 400 million MHL-enabled products worldwide. MHL-enabled products include smartphones, tablets, DTVs, TV accessories, Blu-ray Disc™ players, audio / video (AV) receivers, monitors, projectors, adapters, automotive accessories, cables, and more. For a list of MHL-enabled products or to learn more about how to become a part of the growing MHL community, please visit http://www.mhltech.org/. Established in April 2011, Mobile China Alliance (MCA) is a mobile phone industry alliance under the China Communications Industry Association. It is run by the alliance entity, Shanghai Lulian Information Technology Co., Ltd., and its Secretary-General is Lao Yao. Its membership includes more than 30 mobile phone, semiconductor and internet companies in China. MCA is committed to promoting the sharing of information among enterprises within the alliance, promoting the relevant government departments’ support for the industry, accelerating the branding and globalization of Chinese mobile phones, promoting technological upgrade in the industry, and enhancing the global competitiveness of Chinese mobile phones. It is committed to fully playing its role as a bridge and link between enterprises and the government in the areas of legislation, policies and planning, as well as fully playing its role as a bridge and link between enterprises and consumers, among enterprises, and between enterprises and scientific research, education and supporting institutions in the communication, exchange, cooperation and promotion of areas such as R&D, production, testing, accreditation, standardization, policies, laws and applications. MHL, LLC is the Agent for overseeing and administering the adoption, licensing, and promotion of the MHL Specification. The MHL Specification was developed by Nokia Corporation, Samsung Electronics Co., Ltd., Silicon Image, Inc., Sony Corporation, and Toshiba Corporation as a standard for mobile wired video/audio connectivity that enables the development of interoperable mobile and display products across a broad connectivity ecosystem. MHL, LLC is a wholly owned subsidiary of Silicon Image, Inc. For more information, please visit http://www.mhltech.org. This news release contains forward-looking statements within the meaning of federal securities laws and regulations, including, but not limited to, statements regarding the market size, adoption, features, functionality, performance, advantages and benefits of the MHL 3.0 specification, MHL technology and MHL-enabled mobile and display devices as well as the future of mobile entertainment and productivity. These forward-looking statements involve risks and uncertainties, including, but not limited to, the risks and uncertainties described from time to time in Silicon Image’s filings with the Securities and Exchange Commission (SEC). These risks and uncertainties could cause the actual results to differ materially from those anticipated by the forward-looking statements contained in this news release. Silicon Image assumes no obligation to update any forward-looking statement.